Leh is many things, depending on who’s asking. The sepia-tinted eye of the historian views her as a major hub on the famed Silk Road that extended from China in the east, through India and Central Asia, and onward to Europe in the West. In those heady days, Leh was a halfway house for caravans laden with all manner of precious and semi-precious stones, gold and ivory, pashmina or cashmere wool, cannabis resin, indigo, silk yarn, Banaras brocade and all things coveted by empires in the West. The Silk Road was not one single route and comprised a network, which within Ladakh, fanned out locally from Leh along the Indus Valley and through Kashmir and Amritsar to the west. 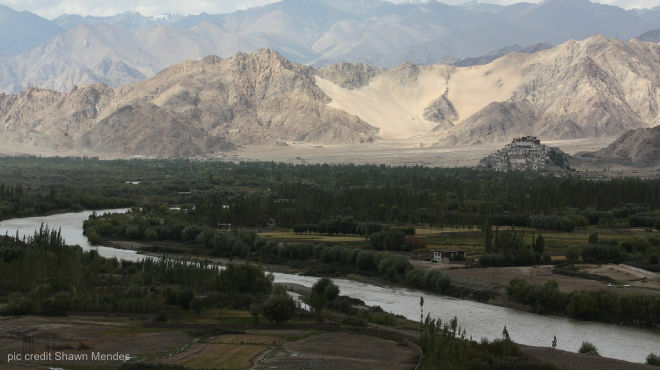 Since it thrived on trade, Leh was already an important settlement and the natural choice as a capital for the two main dynasties that ruled the Kingdom of Ladakh from the 10th century onwards – the Lha Chen and Namgyal dynasties. Leh and Ladakh then fell to the Kashmiris, when General Zorawar Singh came storming in. Under British colonial rule, Leh-Ladakh was recognised as a part of Kashmir and officially incorporated into the Indian Union after Independence. From the tourists’ perspective, Leh is a destination in itself as well as a starting point for visitors embarking on even more exotic journeys into the interiors of Ladakh. The town offers enough to spend three or four days, with ancient palaces, forts and monasteries or gompas to explore. A walking tour through the Old Town will take you on a charming and historic journey back in time, revealing the heart that once throbbed in a strategically important centre of politics, commerce and religion. Leh is located at an altitude of 3,524 mt (11,562 ft), and spending a few days in the town will also acclimatise you to the rarified air. If you don’t allow your body time to readjust, you run the risk of suffering from altitude mountain sickness so following these guidelines is a must. So what gets top billing in Leh? Leh : Some of the must-see sights in Leh include the Leh Palace, Tsemo Fort and Gompa and a number of ancient monasteries. The Old Town and Bazaar with its variety of sights and monuments are a must-visit to experience the true essence of Leh.